Researchers used an MRI method called R2* mapping to evaluate 181 stroke patients. One year after a baseline evaluation, some patients showed higher iron content in a particular brain region, which was associated with worse long-term outcomes. The results suggest that R2* mapping may be added to follow-up MRI after stroke to monitor neurodegeneration. OAK BROOK, Ill. — A simple MRI method that measures iron content can provide a more comprehensive picture of the consequences of stroke-related damage to the brain, according to a study published in the journal Radiology. Researchers said the findings point to a role for MRI brain iron measurements in monitoring recovery from stroke. Strokes can result in significant impairments caused by infarctions, or the death of tissue due to the brain’s blood supply being blocked by a clot. Long-term outcomes may also be affected by delayed degeneration of brain areas away from the location of the stroke. One such area is the substantia nigra (SN), a structure of the midbrain that is connected with other parts of the brain in several complex networks. “Overall, the SN is strongly involved in motor control, but also in regulation of emotions, cognition and motivation,” said study co-author Thomas Tourdias, M.D., Ph.D., professor of radiology at the Centre Hospitalier Universitaire in Bordeaux, France. “Usually, stroke doesn’t directly affect the SN but, by interrupting circuits, stroke can induce secondary degeneration of that area. ” Prior to the new study, this secondary degeneration of SN had only been seen on post-mortem brain examinations. 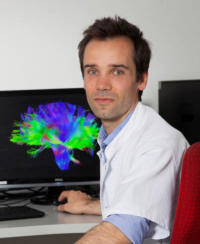 Imaging on a living person has not been able to capture the long-term degeneration, so for the new study, Dr. Tourdias and colleagues employed an MRI technique that measures iron content in the brain. Iron is important for normal brain function, but an excess of it has been linked to neurodegeneration. Iron is released from dying neurons and iron-rich immune cells present around injured neurons. The excess iron further accelerates neurodegeneration through a process called oxidative stress. The researchers used an MRI technique called R2* mapping to evaluate 181 patients who had suffered a stroke. One year after a baseline evaluation, some of the patients showed higher iron content in the SN. This high iron content was associated with worse long-term outcomes, particularly when it was found on the same side of the brain that the stroke occurred. The results suggest that R2* mapping may be added to the follow-up MRI after stroke to monitor neurodegeneration, Dr. Tourdias said, by assessing iron levels in the SN. More generally, the findings lend support to the use of iron imaging as a marker for neurodegeneration, an idea that is already being explored for neurodegenerative diseases like Parkinson’s disease. Therapies that prevent iron deposition could potentially be used to slow or stop the degeneration of the neurons.